Peter J. Bernardi, S.J., PhD, Fr. Father Bernardi is an Associate Professor at Loyola University in Chicago, IL. He received his MA in Philosophy from the University of Detroit, a MDiv from the Toronto School of Theology, and a STL from the Weston School of Theology. He received his PhD in Systematic Theology from the Catholic University of America. Fr. Peter Bernardi is a long time friend and Epiphany Community celebrant. He has been a great teacher and inspiration to our group. In addition to many other events, he led our annual Day of Reflection in October 4, 2014. The theme for the day was "Pope Francis, New Perspectives on Christian Living." Although currently residing out-of-state, Fr. Bernardi visits and celebrates with us when his schedule allows. Rev. Aniedi Okure is presently the Director of the Africa Faith and Justice Network in DC. He is a a member of the Dominican Order, and an adjunct faculty in the Department of Sociology, The Catholic University of America, and a Fellow of the Institute of Policy Research and Catholic Studies. He is an alumnus of Les Facultés Catholique, Kinshasa, University of Ife, and of The Catholic University of America; and did graduate studies at Boston University. Aniedi Okure's specialization is in the sociology of knowledge, religion and social change, civil societies, and citizenship and identity in postcolonial societies. He has taught at The George Washington University, the University of California Davis and the University of Ife, Nigeria, where he served as associate director of campus ministry for six years. Since 2003, he has contributed to many research projects at IPR (then, the Life Cycle Institute). His research interests are related to the movements of international priests and religious; African and Caribbean foreign-born in the United States; church and state in postcolonial societies; and cultural diversity in a global society. He studied the impact of foreign-born clergy in the United States with Professor Dean Hoge; co-authored International Priests in America: Challenges and Opportunities (2006), and researched for the study on African and Caribbean Catholics in the United States (2008). He is a frequently invited speaker on topics concerning international priests and cultural diversity. From 1995 to 2001, he was the Coordinator of Ethnic Ministries at the United States Conference of Catholic Bishops, serving as research specialist on ethnic groups and immigrant communities in the United States, and was co-chair for the breakout sessions of Encuentro 2000. Currently, he is studying family relationships and the negotiation of household tasks among the African-born in the United States. Fr. Dave Schwinghamer, M.M., is a member of the Maryknoll Office for Global Concerns team. Fr. Schwinghamer who has served as missioner in East Africa, is a program associate for Africa and Sustainable Peace. His overseas experience was in Tanzania beginning in 1969. While in Tanzania he learned Ki-Swahili and has worked in several different parts of the country in both rural and urban assignments. From 1990-96 he was director of the Center for Faith and Justice in Dar es Salaam. He has served as an international election observer for elections in South Africa and Tanzania. He has graduate training in Conflict Transformation from Eastern Mennonite University and an MA in Social Science from the University of Chicago. His areas of research are on the causes of hunger and the causes of war in Africa; the regional economy of Sukumaland, Tanzania; and the Burundi peace process. From 1997-1999 he did pastoral work with the Jesuit Refugee Service in the refugee camps in western Tanzania. Click here to learn more about the Mary Knoll Office for Global Concerns. The Reverend Anthony J. Pogorelc, S.S., M. Div. (St, Michael’s College of the University of Toronto), M.S., Ph. D. (Purdue University 2002). Rev. Dr. Pogorelc is a research fellow at the Institute for Policy Research and Catholic Studies at The Catholic University of America where he directs the Changing SEA (Spirituality of Emerging Adults) Project. ﻿ Aimed at assisting ministers to young adults, this Lilly funded project is in the process of writing a book that will a. synthesizes scholarly writing on the social forces that shape the lives to today’s young adults b. present the characteristics and best practices of congremations that effectively minister to them, and c. present findings from a national survey that looks at the religious beliefs and practices of young adults ranging from those who are traditional and active in churches to those who engage churches in a variety of ways. ﻿﻿Click here to see more from Fr. 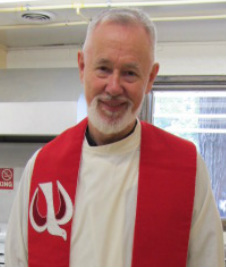 Joe McCloskey, SJ - Priesthood after 50 years.